9.00 AM to 10.30_AM - Registration of candidates and submission of applications by a the candidates. 11.30 AM to 12.30 PM - Written Test (Multiple Choice Questions - no negative marking). Display of list of candidates selected for interview as soon as it is ready. Interview of some of the candidates may be held same day. (The list of candidates will be made available on the website of the Council and also on the Notice Board of the respective offices indicating therein time schedule of the interview). 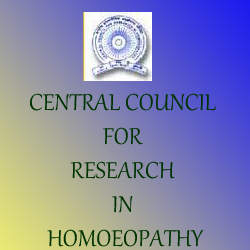 Central Council for Research in Homoeopathy (CCRH) was established as an autonomous organisation in 1978, under the Dept. of AYUSH, Ministry of Health & Family Welfare, Govt. of India. Primarily a research body, CCRH has a multi-dimensional approach to research and its varied research activities include ‘Survey, collection and cultivation of medicinal plants’, ‘Drug standardisation’, ‘Drug proving’, ‘Clinical verification’ and ‘Clinical research’. Besides, CCRH also collaborates with other research bodies for researches and monitors extramural researches.